Why we always present on every event? Because we always on the go to serve all the developers we are in! 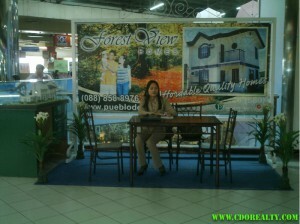 Just yesterday October 25, 2010, the housing festival in Gaisano has started. This is now participated with Menzi Orchard Residences, Johndorf Development Corporation, Camella Homes Communities and the Pueblo Development. We, in RPM realty, are serving one of Pueblo’s subdivisions, the Forest View Homes. The festival is would be until on 31st on this month. The subdivision where you can choose the property you would have for your family. This is the place of considerable venue, which offers complete and good ambiance for each family member. It is still going on and anyone is invited to visit the area, and have your choice of house to avail with! We have the total impact of goodness and well designed houses and the location in your preference. Look for your dream area and house to live in; consider the relaxing and the comfortable living you would have to be! Come and join us in this Housing Festival here, in Gaisano Mall, CDO.